In this day and age of high-tech dentistry, the main theme is minimally invasive dentistry. A lot of times we diagnose small cavities and parents wonder why we should restore them if they are not large or not causing pain or sensitivity. In the old days, cavities had to grow to a certain size in order to justify drilling a large hole and packing it with amalgam. That was based on 19th century dentistry. Today, we have superior bonding and laser technology. We do not have to wait for the cavity to grow and weaken the tooth structure before restoring it. 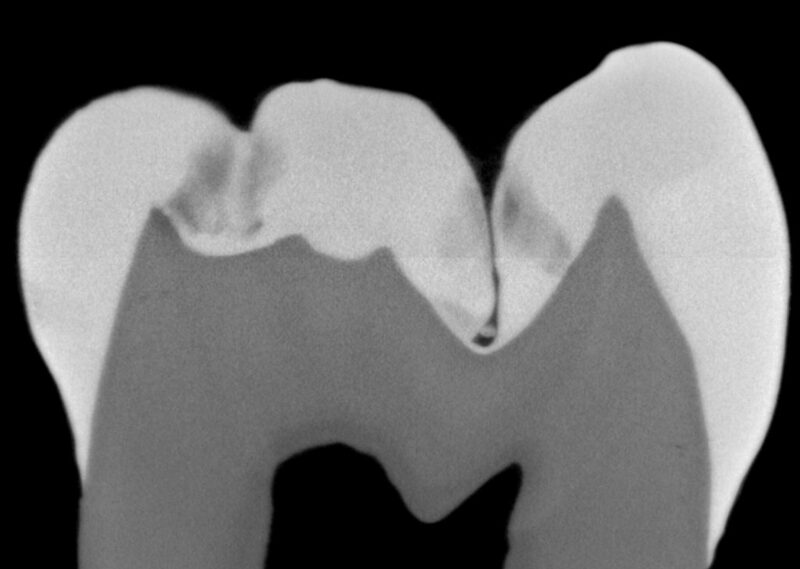 This picture shows the typical appearance of teeth with early fissure decay. Fissure is the name for the deep grooves located in the chewing area of the molars. Caries-causing bacteria can penetrate these fissures and this has consequences: These bacteria called streptococcus mutans, attack the thin enamel and penetrate dentin,which is the underlying live layer of the tooth. At that point, the decay spreads faster and undermines the enamel even before it is visible to the naked eye. Fissures that are barely seen on the surface of a tooth can extend very deep into the tooth as this cross section of a tooth shows. In our office, we use The Waterlase to clean out the fissures, and many times if we come across cavities,we can complete the procedure without having to give a shot. 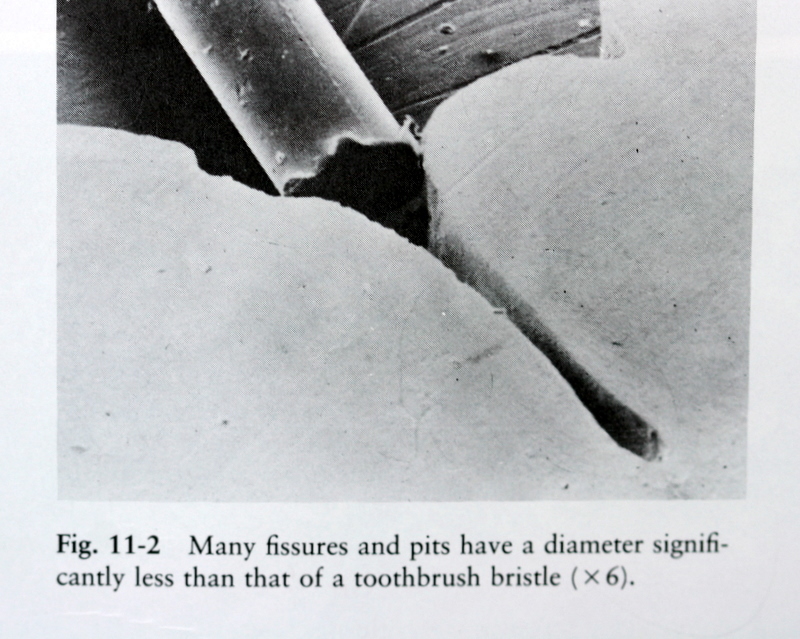 You might think that good brushing your teeth will avoid the problem but look at this microscopic cross section of a fissure and one bristle of a toothbrush and you realize that brushing will not help. 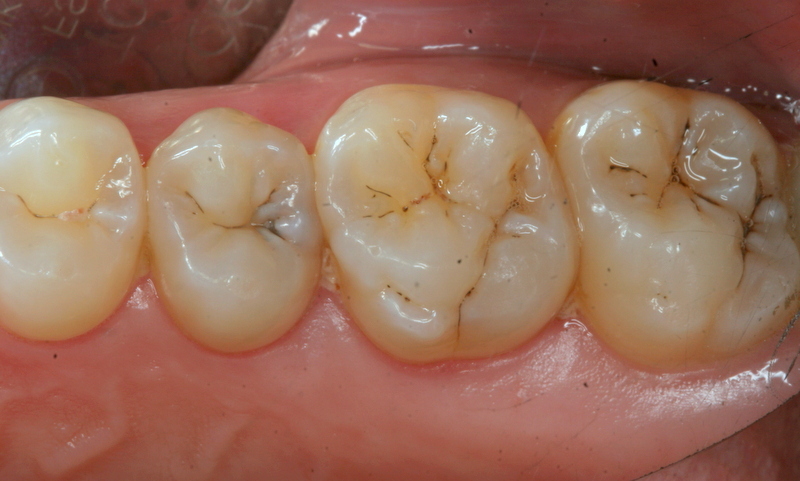 The following video demonstrates the handling of fissures with the Waterlase Dental Laser. This entry was posted in Laser, Repair, Video by Admin. Bookmark the permalink.